Here's a refresh of the floor plan and elevations for the master bath remodel at the Break Arch Project. You can see the before images here, and a lot more by clicking on the Break Arch Project catagory in the sidebar. Looking from the bathroom entry towards the tub and shower. looking past the tub towards the shower. And as usual I can't end this post without including a sneak peek of what's to come, and some design tips, AKA, The Take Away. Consider repeating shapes in your space for a well-thought-out, refined look, like I've done with rectangles. Notice the soap niche in both the shower and tub...and as I share more photos in upcoming post, the repetition will become even more prominent throughout the space. Be open-minded when it comes to redefining space. Try to rid yourself of any fixed ideas of how the space has to be unless it's an absolute must. This project is proof of what being open-minded can do. 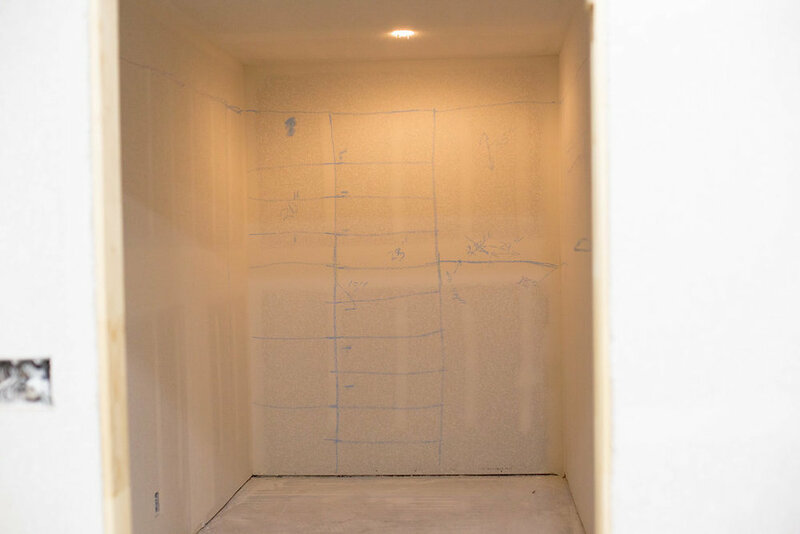 Fine tune closet designs by mapping it out on the wall like is shown in the photo above. *I wasn't part of this design process...the builder did it with the clients but I think it's a brilliant idea for visualization! It's hard to believe it's even the same space! Come back soon to see more progess shots.